"You do not expect extensive wildfire in Swedish mountain tundra or in Welsh mountains, but we see that this year," said Pomeroy. "This is further evidence of remarkably fast changes in climate around the world as a result of new extremes of heat and variable precipitation, due to human-introduced greenhouse gasses." These fires are also sprinkling ash across the Columbia Icefield and glaciers that make up the headwaters of the Saskatchewan, Mackenzie, and Columbia River Basins. This ash will likely speed up the melt due to the increase of solar radiation on the glacier, whereas clean ice would reflect the sun's rays. 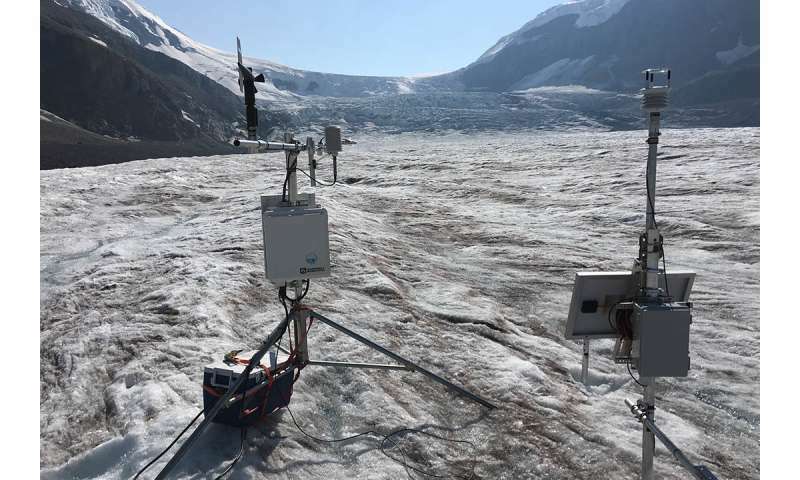 "This is the darkest I've seen the Athabasca Glacier in my life," said Pomeroy, who has been studying hydrology in the Rockies since the early 1980s. "The sunrise in Canmore on the morning of Friday, August 17th, 2018, was surprisingly smoky in a way that made it eerily reminiscent of some of the sci-fi doomsday thrillers of the 1980 and 1990s," he said. "We are now seeing the direct climatic connection that climate scientists have been talking about for years, between water and its diametric and symbolic opposite fire. If you don't have the former, then you get the latter. Higher mean annual temperatures, especially in northern Canada, are already resulting in increased wildfire risk." "We are also seeing once again this year that a slower and wavier jet stream is causing the conditions that exacerbate the wildfire threat to intensify and persist longer in vulnerable places. As a result, fires are already becoming bigger, hotter and faster. Just as scientists predicted, methane releases have accelerated from the thawing permafrost of the Arctic. We now have forest fires that are fueled by the methane they release," said Sandford. "The risk of fire can be predicted with coupled climate and water models," said Pomeroy. "For instance, the exceptionally low snowpack and dry soil moisture or dry duff layer under the forest canopy that led to the Fort McMurray fire in 2016 was predictable by our models. Once the risk of fire is high it is harder to say exactly where the fire will start because the start is often from a dropped match or a spark from a vehicle or a lightning strike. But it is possible to say where the risk is high. "Risk can be mitigated by reducing the density of forests where there are communities, mines, roads and infrastructure right next to the forest. We often have very dense, old forest canopies right next to boreal forest and mountain communities and these are very dangerous situations given the recent increases in wildfire in Canada. We also need better prediction of risk of fire so that fire bans and other preparations can be made when risk is high." Any decent model of forest fires has underbrush and a dry duff layer building up under unmanaged forests until it burns. Wash, rinse, repeat. The solution is not to wring our hands, but to manage the areas at risk. Yes, I know that many nature lovers are going to be horrified at the idea of logging old growth forests--but the only other choice, independent of global warming, is to burn them. Managing does not mean destroying the forests. It means cutting and maintaining firebreaks, clearing undergrowth or burning it during the rainy season. (Or when it does rain in arid areas.) And finally use fire towers, drones, or satellites to detect fires early enough so that one water drop flight can stop or slow dangerous fires early. Can this be made to work? Sure. Dozens of countries have been doing it for a century or more. A few decades ago the USDA Forest Service began requiring paperwork for any silviculture. This lets "treehuggers" delay or prevent normal management.